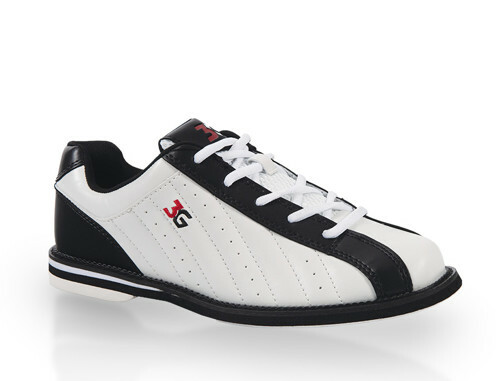 3G has come out with a great looking shoe that can be worn by men or women. This shoe includes the standard universal slide sole for little slide. Be sure to check the size chart to make sure you are purchasing the correct size! VERY HAPPY WITH THIS SHOE. COMFORTABLE AND THE PRICE IS GREAT. As the company you should advised customer that they run smaller then normal sizing. By a half size. I was smart enough to take the 6.99 return cost in the event that they were not the right size. The shoes are still a great value at the price. By BEAR from VICTORVILLE, CA. MY GRAND SON LOVES THESE SHOES ! By Lynn from Duluth MN. Happy to found a good fit. I hated having to wear rented shoes, they usually are to tight,but these are wide enough for my chubby feet. I got these for my husband. These have been shared by husband and son. Both report the fit is very nice. I love them. They performed great right out of the box with no need to break them in. I bowl on a weekly league and bowl 10 plus practice games a week. This shoe looks good, it feels good, and best of all the price was right. They run about a half size small so remember to order a half size larger. Good, wide, comfortable, excellent value. Does the job just fine. The ONLY nit-pick I can think of is the sole is slightly thin, so standing around on this pair for 3+ hrs could make your feet a little tired. I just put in a pair of after-market soles and it works like a charm! Bought 4 pairs of these for my kids & myself to use during the summer bowling program. Good enough for that but very slick soles leading me to focus on not slipping vs where my ball is going. These run 100% true to size and I have a wider foot. Had to spend $12 extra dollars exchanging sizes because others said they run big. Just order your regular size!! These shoes are great for the beginning to intermeidate bowler who is looking for good performance at a great price! looked good / but didn't fit well. If you only bowl every so often and dont like renting shoes then these are ok, but not for someone who is competitive. These shoes stick hard and sliding soles peel of quickly. You get what you pay for on this product. Yes they are comfy, yes they look nice, but they can not take the wear and tear. The slider is pretty much torn off of my left foot and on the right, the sole completely cracked along the slider. I have only had them for a year. They would probably be ok if you were a once in a while bowler, but are not worth it if you bowl league play or competitions. Great shipping, good deal! Cheapest new shoes I could find no the net. Got a matching pair for my wife and I and both sizes fit fine. 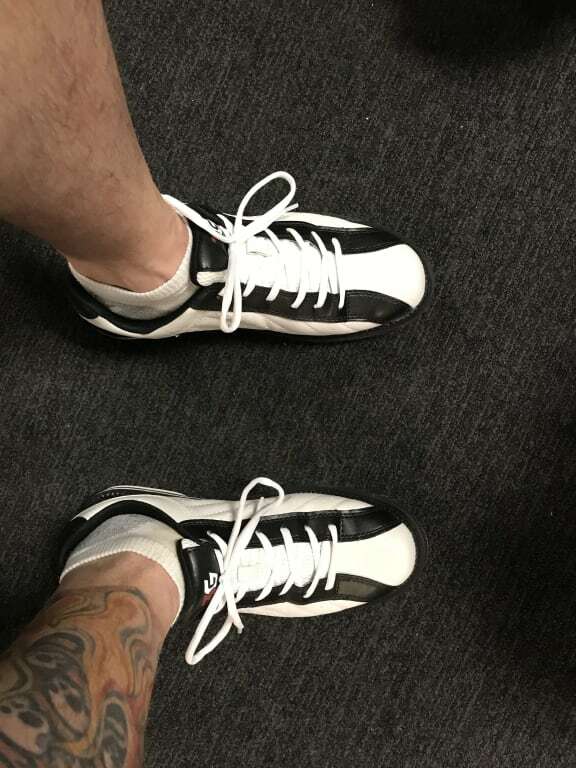 "most comfortable bowling shoe ever"
worst shoes i ever purchased. These shoes dont slide and seen a lot people use a sliding slippper to make then slide. What is wrong with these shoes? Am mad because this waste of my money and very disappointed.I buy all my shoes online with bowling.com. got as I only play once a week on a weekly deal at the local alley... only had used about 6-8 times and the felt on my left shoe (right-hand bowler) has already worn through and I basically threw myself onto the lane due to the quick stop it played after being worn through... at first i thought it was a moisture issue but after closer examination it was clear to tell the product had already worn though its life time... stay clear. I have been using this product since I purchased it 2 months ago, and love them. So far I love the styling and they are very comfortable. Excellent shoe for casual bowlers. Took a little getting used to as there is just a tad more slide to them than a typical bowling alley rental shoe but easy to get used to. Only used them once so far so the only unknown is the durability. If they last me a couple years they are absolutely worth the price. for the price this shoe is worth every penny. very pro looking and comfortable. glad i purchased this shoe. At $2 or more for renting shoes to go bowling, these shoes will almost pay for themselves in one league. bought for 15 yr. old daughter. She loves them!! LOve the product. Bowls on school bowling team and shoes are great. ALso a league bowler and bowl in many tournaments. Did not use gave to return, does not fit. Great question Ed! The 3G Kicks Unisex Black/White will be a little wider than a standard B width in a womens shoe. Hope this helps! 16 of 18 customers found this answer helpful. Did you? Yes | No Did you find this answer helpful? Yes | No Thanks for your feedback! Do theses run big for men? I am a size 9.5 in mens and I am a man so would it stay the same? Hello Clay! The shoes should run pretty true to size for men. I would suggest ordering a size 9.5 and then maybe purchasing the True Fit Guarantee just in case you get the shoes and they don't fit how you want them to. 14 of 14 customers found this answer helpful. Did you? Yes | No Did you find this answer helpful? Yes | No Thanks for your feedback! I have a SST 8 Dexter size 8.5,What size fix me for this brand? We would suggest staying with the size you have now, but we do offer a TrueFit Guarantee for $5.99 that can be purchased with the shoe. It will allow for free shipping on an exchange, and super fast exchange process. Hello DJ. Unfortunately, the 3G Kicks Unisex White/Black do not offer a wide width version. What if I don’t purchase the tru fit guarantee? Do I just pay return shipping or are there more costs involved? These will have microfiber slide soles. Is there a universal traction sole for these shoes? These will have universal sliding soles for both shoes. DOES THIS SHOE IN THIS COLOR RUN SMALL LIKE THE ALL BLACK ONES? We have sizes 9.5 for men and women. Due to the time it takes to produce the 3G Kicks Unisex Black/White ball it will ship in immediately. We cannot ship this ball outside the United States.